One of London’s jazz scene’s most vibrant and forward thinking artists, Sarathy Korwar presents a night dedicated to the music of his homeland; India. 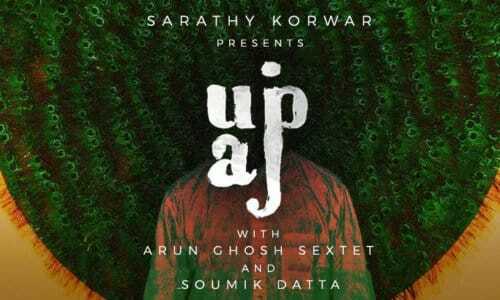 Sarathy’s show is called Upaj, which translates as ‘improvise’ in Hindi/Sanskrit, and will present sarod maestro Soumik Datta and Indojazz clarinettist Arun Ghosh. Described by the late Pandit Ravi Shankar as a ‘natural born improviser’, Arun Ghosh is a renowned innovator of the modern IndoJazz style. The Brtish-Asian clarinettist’s Sextet invoke a psychedelic IndoJazz sound, a sonic space where Alice Coltrane meets Spiritualized, ADF and The Velvet Underground. Featuring music from new album, But Where Are You Really From?, alongside euphoric live favourites, Ghosh’s sweet and timeless melodies give birth to soaring improvisations and raag explorations, driven by a heady mix of dub-heavy bass, tabla trickery and ferocious drum explosions. Soumik is not only a solo virtuoso. He is also innovative and generous, working with other musicians to create fabulous new pieces, bringing his sarod and their instruments to new and wider audiences around the world.